Holiday traditions can extend so far into the mists of memory that nobody remembers how these lovely, comforting practices originated. 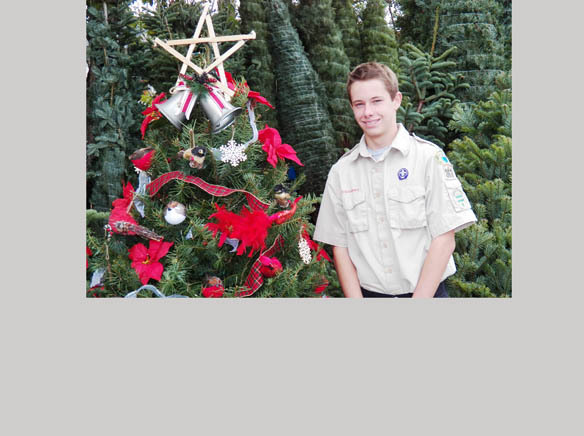 El Cajon’s Boy Scout Troop 363 opened the organization’s annual Christmas tree lot on the morning of Nov. 26, outside the local El Cajon Elks Lodge #1812. Williams, a Spring Valley resident and professional architect, has three sons who belong to the 19-member troop. His son Kyle is 15 and was designated troop spokesman for opening day. Kyle Williams has belonged to this Boy Scout troop since he was six years old. He said that this is his third or fourth year to work at the lot, assisting Christmas decorators to choose that “just right” tree for their homes during the holidays. All Boy Scout Troop 363 members work at the lot, during weekend hours of 8 a.m. through 9 p.m. On weekdays, purchasers can visit from late afternoon through evening, 4 p.m. until 9 p.m. “Our labor force is in school,” Greg Williams explained. Jamba Juice has a booth on the site with a choice of healthy beverages. Tree delivery is offered. Prices are based on tree height, ranging from $34 – 94 for Douglas firs, $57 – 141 for Nordmann firs, and $72 – 132 for Noble firs. The Christmas tree lot is located at 1400 E. Washington Avenue.